Oops - we don't appear to have a video for the CR-190i II UV. 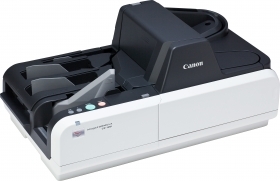 How does the Canon CR-190i UV prevent fraud? It captures standard and UV images, such as company logos or other proofs of authenticity printed with UV inks, in a single pass to help avoid counterfeit cheques being processed. The imageFORMULA CR-190i UV also improves fraud detection by helping to detect if any details or sensitive areas of a cheque have been tampered with. This can equally be applied to the processing of vouchers and coupons, where cheque scanners are often used.